Beautiful Beaded Bracelets made with semi-precious stones, love and intention. 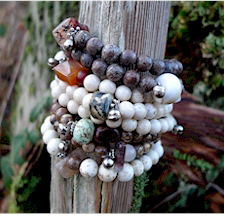 Each bracelet is unique and comes with a tiny silver bell to connect us to sacred healing sound. My intention with belle & bede is to create tiny devotional healing beads that have an origin in malas, rosary, prayer and medicine beads. The stones carry a specific energy essence to support and heal and are a thing of beauty and awe... natural rock from the earth, so magical and mysterious. You get to carry this earth medicine with you, feel the magic, say your prayers and look gorgeous all at the same time.